Whilst having my niece's and nephew, Megan, Louie and Mia up to stay with us for a week, it only made sense to do some baking with them. 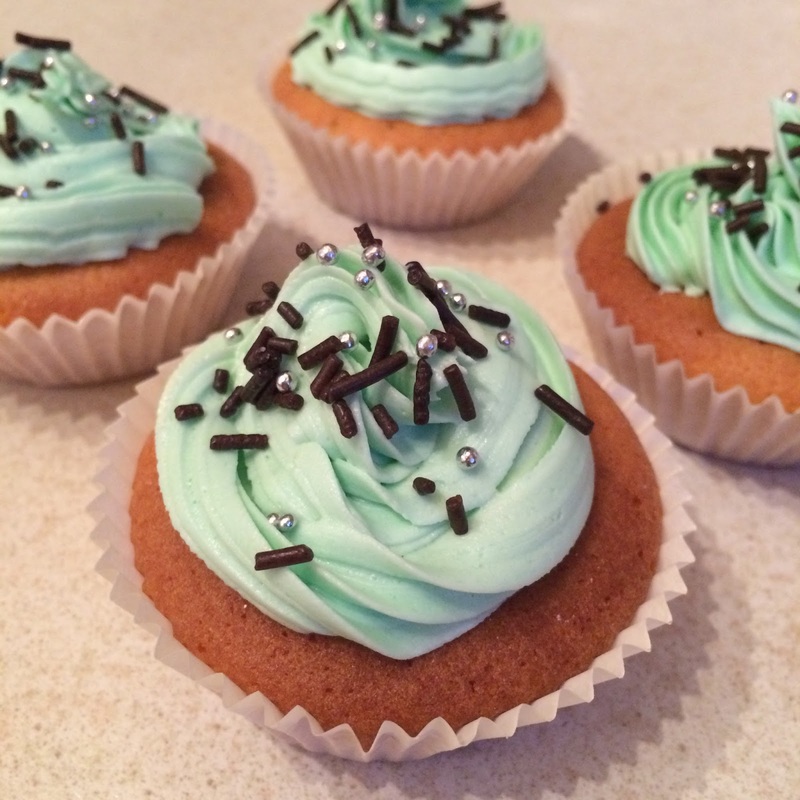 We chose to bake some cupcakes with vanilla extract mixed in with them and then topped with a mint green buttercream icing and a few decorations. Start off by pre-heating your oven to 170c, this makes sure your oven is at the right temperature for when the cupcakes are ready to go in to bake. 1 - Place your butter and caster sugar into a mixing bowl and mix this together until it is light and fluffy. 2 - Then add all 3 eggs aswell as the 2 teaspoons of vanilla extract and mix this all together until it is combined and looks like a yellow batter. 3 - Next step is to add the flour into the mixture and mix this again until it is smooth in consistency, I chose to leave mine mixing for about 5 minutes as the longer its left mixing enables air to get into the mixture, and this makes the cupcake texture lighter. 4 - Then spoon the mixture evenly into your prepared cupcake cases....this mixture should give you 24 cupcakes in total. Once your cupcakes are ready, leave them to cool completely for about 30 minutes, otherwise the buttercream icing will just melt off the cupcakes. Now for the buttercream icing, the amount of ingredients I used was more than enough for 24 cupcakes as there was loads of it left over, so feel free to half the amount of these ingredients for the buttercream icing if you wish to. Place the butter and half the icing sugar into your mixing bowl and mix these together until they are smooth, then add the rest of the icing sugar to the mixture and mix this again until it is all combined and is creamy and smooth. At this point if you wish to colour the buttercream icing, then add a few drops of your choice of food colouring to the mixture, and mix again. Then spread this over the cupcakes with either a knife or a piping bag, and then decorate as you wish to.